Pressurized air (from a shop source) flows through the Cricket Air Circuit, cycling the Ram. 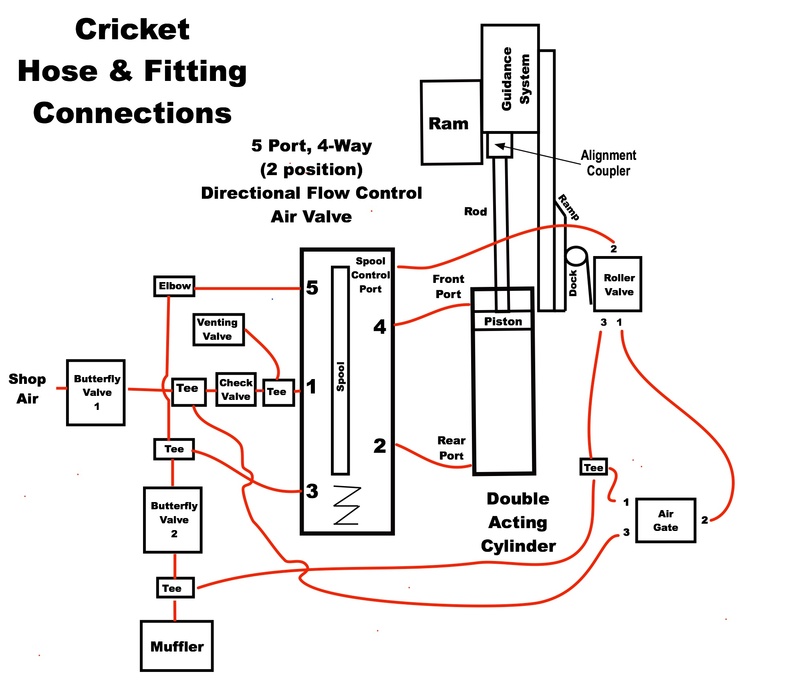 The heart of the Cricket Air Circuit is a Directional Flow Control Air Valve (hereafter referred to as the 4-Way Valve). The 4-Way Valve is used to route pressurized air (alternately to the front, then rear) to a dual-acting cylinder, to cycle the Ram. An Alignment Coupler is used as an interface between the Cylinder and Ram. A Roller Valve monitors the position of the Ram and signals the 4-Way Valve when it’s time to reverse the direction the Ram is moving. When the 4-Way Valve receives the signal, it moves an internal mechanism, (called a Spool) to dynamically reconfigure its internal air paths. After the spool is moved, pressurized air is directed to the opposite end of the cylinder, initiating the change in direction the Ram is moving. The Ram momentarily continues in the same direction (due to momentum), then reverses direction. A Check Valve is used on the input port of the 4-Way Valve to prevent back flow of air when the direction the Ram is moving is reversed. Butterfly Valves are used at the front and back ends of the Cricket Air Circuit to control entry and exit of pressurized air. The Butterfly Valve on the back side of the Air Circuit is used (via linkage to the Treadle) to control the volume of air passing through the Air Circuit. This valve, by controlling the volume of air passing through the Air Circuit, controls the cycles per minute (speed) of the ram. A second Roller Valve is used as an Air Gate to disable Ram Cycling (when the Treadle is in its fully-up position) in support of the Single-Hit and Clamping features. 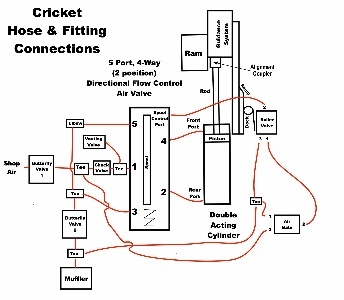 A Venting Valve is used to release air trapped in the Cylinder when the Cricket is shut down. A Muffler is used to reduce exhaust noise. All details for each Air Circuit component is discussed in the Long Story.